The application is more than a conclusion to a Bible lesson. This part of the plan should look at the implications of what has been learned and seek to understand how it can be applied to life. Teachers can use a variety of methods to help students not only discuss what they could do but also practice applying it. In this four page teacher training worksheet Bible teachers will examine God's intent for application and look at the implications for Bible lesson preparation, methodology, and follow-up. 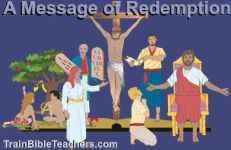 This two page teacher training worksheet targeting teachers of children emphasizes how Bible teaching that simply applies natural principles of learning will yield natural results, mere behavior modification. Though God did design people to learn in certain ways, that is only the starting point.